The Greater Toronto and Hamilton area (GTHA) is Canada’s most densely populated area – and this means problems for commuters. The Metrolinx Smart Commute initiative helps commuters improve their experience commuting from A to B, with a goal to reduce gridlock, save time, and save money. It does this through outreach to 340 major employers, and over 720,000 employees and post-secondary students. Unfortunately, the websites that support and drive the initiative were dated, not “in-brand”, and costly to maintain. Furthermore, the sites were not built on a social platform, and therefore could not take advantage of Social Media, a key communications channel. Even worse, the 13 Smart Commute offices did not have a way to share resources, resulting in duplication – and inconsistent public messages. 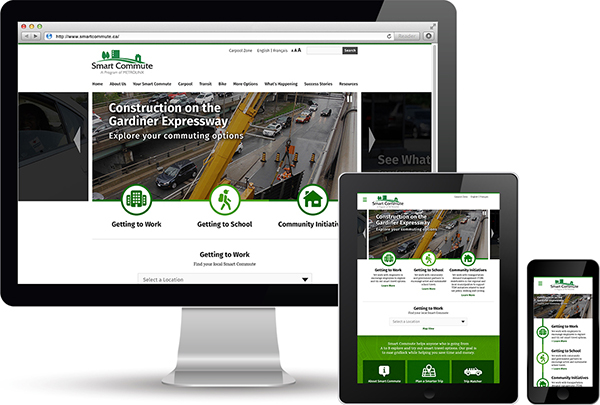 Metrolinx engaged us to redesign and develop the Smart Commute main site, 13 different municipal websites, as well as an Intranet that could be viewed on Computers, Tablets and Mobile devices. We delivered these 15 websites on time and on budget – all within 4 months of being awarded the engagement. This involved inventorying all content, website design, developing a new information architecture, developing a site network (including site security), redeploying all content, building in SEO. We also developed training documentation, and trained Metrolinx staff on site management. The sites are all AODA compliant, and are built in a way to encourage sharing between each site via the Intranet. With increased site traffic, social media integration, and improved internal efficiency driven by the intranet site, the Smart Commute sites (and the connected Social Media venues) play a large part in reducing GTHA gridlock. And during the 2015 Pan Am/ Parapan Am games, the sites became a critical component of the transit plan.